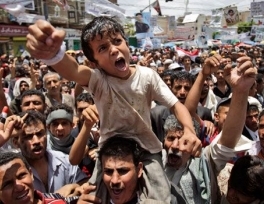 Yemeni air force planes on Tuesday bombed rural areas where tribesmen demanding the resignation of President Ali Abdullah Saleh live, the tribesmen said, a sign that violence gripping the fractious state may be escalating. 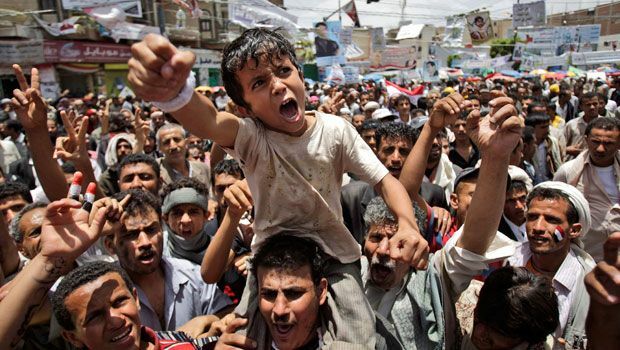 The planes bombed an area north of the capital Sanaa where tens of thousands of protesters have been rallying daily to demand an end to Saleh’s nearly 33-year rule. At least four tribesmen were wounded in the raid, a resident said. Tribesmen told Reuters the Republican Guard, led by Saleh’s son, had been trying to pass through the tribal area en route to the southern coastal province of Hadramout where one of several army units that have defected is based. The tribesmen have had violent clashes with Saleh’s troops in recent weeks, residents said. The jets stopped bombing after a few hours, tribesmen said, and the Republican Guard agreed with the tribesmen not to send troops to Hadramout. Opposition sources had complained that troops were being sent to Hadramout to crush protests there. Many demonstrators across Yemen, who include students, tribesmen and activists, have vowed to stay on the streets until Saleh, who has clung to power despite three months of protests, steps down. At least 154 people have been killed in the unrest.